Patrick and Louise (Aiden Gillen and Eva Birthistle) who recently lost their daughter Alice (Ella Connolly) in a dog attack move to the village of Wakewood. There they discover that their landlord Arthur (Timothy Spall) can perform a ritual that will bring people who died less than a year ago back for three days, giving them time to say goodbye to Alice. When the ritual is performed though, something may not be quite right. Hammer Horror is a legend of British cinema, but the attempt to bring it back to life, beginning in 2008 with Beyond The Rave, produced more misses than it did hits. 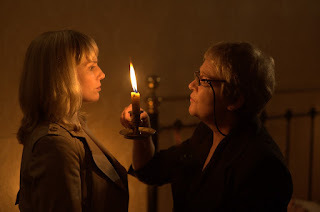 Outside of The Woman In Black and Let Me In, most of the new Hammer productions flew under the radar, and there hasn't been a film from the studio since 2014's The Quiet Ones. You might be forgiven for thinking that in relaunching a legendary studio, the goal would be to make films that would mine any nostalgia for the original Hammer films. 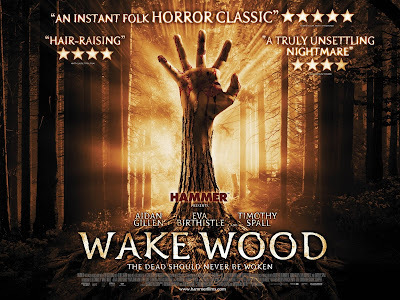 Wake Wood probably wouldn't have felt out of place in the studio's heyday, but it's not an attempt to recapture old glories. The film actually hews closer to The Wicker Man than any of the best known Hammer films. It's set in an apparently isolated and insular community, in which an ancient ritual is performed with the town's most prominent man performing the key part of that ritual. 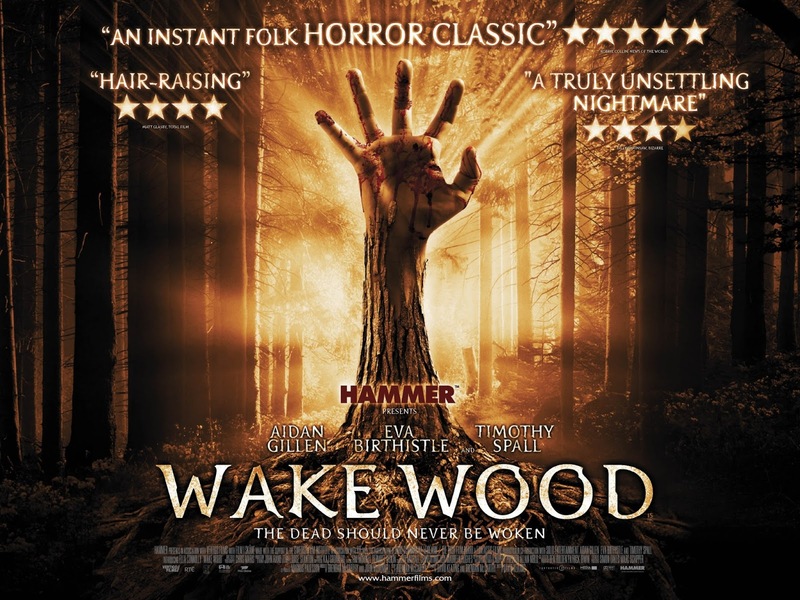 That said, this isn't some empty homage, Wake Wood creates a spooky atmosphere of its own, along with a surprising emotional weight. The way the ritual is established, with a 'visiting' girl who comes into Louise's pharmacy, balances this particularly well. Suggesting what's going on without initially coming out and dropping a load of exposition on us. Like many of the best horror films, Wake Wood grounds its characters motivations in reality. It is easy to understand how the agony of the sudden loss of a child could drive a person to embrace any possibility, however remote, for any time, however brief, to see that child again and be able to hold them and say a proper goodbye. Aiden Gillen and Eva Birthistle give simple unshowy performances. You believe them as a couple, you believe in their trauma and the different ways they process it, and this makes the film's supernatural side easier to swallow. The film builds slowly, with Ella Connolly, Gillen and Birthistle gradually establishing, through some unsettling moments that there is something not quite right about Alice. The first, and one of the most effective, of these is when they note that their daughter's eyes are now brown, like those of the man whose corpse they used to resurrect her for this brief time. This sense builds through Alice's behaviour and that of the townspeople, who also sense that something is amiss, setting us progressively more on edge scene by scene. While it does some good solid atmosphere building, this doesn't mean that Wake Wood shies from the more visceral scares. The ritual itself is wince-inducingly nasty at times, Alice's amputated skeletal finger being placed in a corpse's mouth being one of the less nasty images. The third act also gets impressively gory, in a way the old Hammer productions didn't often get away with. It's worth noting that animal lovers may find themselves turning away from some of the scenes here, not only is Patrick a vet, which we see in pretty graphic detail, but there are some other nasty moments involving animals. However, it's not the film's gore but its emotional corre that sets it apart. The film is defined by loss and a parent's reaction to that loss, it's about sadness giving way to desperation for the tiniest amount of hope, and that truly resonates in the film's ending. It's a great sequence; brutal in implication, devastatingly sad but also the only route to fresh hope for a better future. It's a perfect note to end the film on, closing both memorably and by encapsulating the feeling of the film as a whole. There are various DVD and Blu Ray releases available (though apparently no UK Blu) and the film has just been made available via UK Netflix.